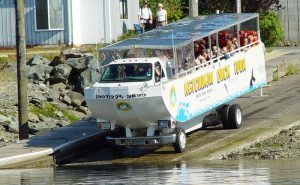 Welcome to the Ketchikan Duck Tour! Our modern, state-of-the-art, amphibian will take you on a 90 minute tour through the rustic streets of Ketchikan, Alaska showing you new and historic sights. This is a fun-filled adventure showing you all the best that Ketchikan has to offer! Begin your Ketchikan Sightseeing adventure with a Splash as you ride on Alaska’s only Duck Tour! Travel by the salmon ladder on Ketchikan Creek viewing the spawning grounds and live salmon in season, picturesque Whale Park with its beautiful flowers and antique clock, and Creek Street where you will learn of Ketchikan’s colorful past and salty beginnings. Next, get ready to pick up your feet and put your hands in the air as The Ketchikan Duck Tour literally drives you into the scenic harbor of the Tongass Narrows! Feel the energy of the “Salmon Capital of the World” as you pass by our diverse local fishing fleet. Motor down the channel for up close views of local fishing canneries, seaplane docks and Ketchikan’s waterfront community. *All internet reservations must be made 24 hours in advance, if less than 24 please call: 907-225-9899.